Charlie Hebdo: Don't take al-Qaida's claim of responsibility too seriously. 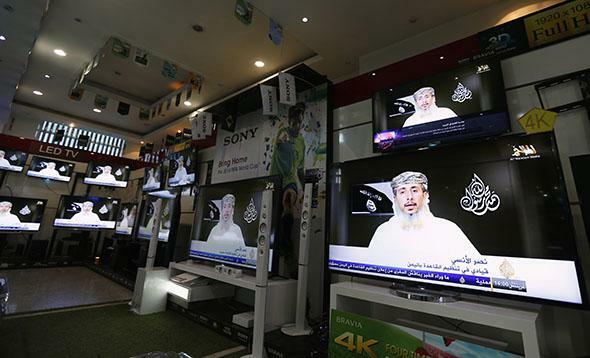 Nasser Bin Ali al-Ansi, a leader of the Yemeni branch of al-Qaida, appears on televisions in Sanaa, Yemen, on Jan.14, 2015, as he delivers a message claiming responsibility for the attack on Charlie Hebdo. As expected, the Yemen-based affiliate al-Qaida in the Arabian Peninsula has claimed responsibility for the attack on Charlie Hebdo one week ago. “The one who chose the target, laid the plan and financed the operation is the leadership of the organization,” said the group’s statement, which also said the attack had been ordered by global al-Qaida leader Ayman al-Zawahiri and that late American-born cleric Anwar al-Awlaki played a part in the planning. It would be a mistake to take the claim completely at face value. For one thing, as the New York Times noted on Twitter, AQAP has made dubious claims of responsibility before. In 2010, for instance, the group claimed to have caused the crash of a UPS cargo plane in Dubai as part of the foiled “package bomb plot” of that year, which involved sending freight packages carrying bombs to the United States. Investigators later determined that the UPS crash was caused by overheated lithium batteries. AQAP, evidently, simply decided to take advantage of the timing. While Zawahiri has himself expressed skepticism about unqualified actors hurting the al-Qaida brand by conducting operations under its banner, the “networked” model of terrorist attacks, in which bands of militants receive ideological inspiration and in some cases tactical training from a well-known group but operate more or less independently, is actually a great deal for groups like al-Qaida. It allows them them to expend minimal resources, maintain plausible deniability for failures, and every once in a while claim credit for spectacular successes. While “lone wolf” and networked attacks are probably inevitable, 13 years after 9/11, Zawahiri and the al-Qaida leadership’s ability to coordinate spectacular attacks on the West has actually been severely degraded. Between the death of Osama Bin Laden, the brutally effective drone war, and the rise of new competition in ISIS, it’s been a rough few years for al-Qaida’s brand. Al-Qaida honchos have more than enough incentive to exaggerate their own role in a rare success in order to demonstrate that they’ve still got it.